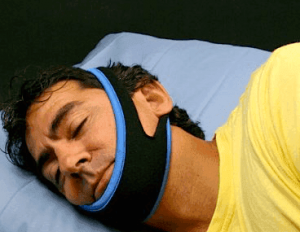 My Snoring Solution uses a chinstrap or jaw supporter to stop you from snoring. The Continuous Positive Airway Pressure (CPAP) device uses an air pump to force air under pressure through your nose to keep your airway open. Neither device is a snoring mouthpiece. The CPAP has a nasal or face mask that covers your nose and/or mouth. The My Snoring Solution chinstrap fits around your head and upper neck below your ears. The CPAP was designed to treat patients with sleep apnea. 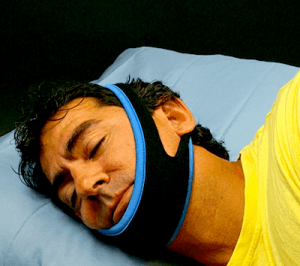 It does a good job and almost 100% guarantees it will stop you from snoring. My Snoring Solution has no moving parts and does not require fitting or special cleaning and worked as well as a CPAP did in my test. The My Snoring Solution device works almost right out of the box. You do not need to put anything in your mouth. The chinstrap fits around your lower jaw and holds it firmly in place, thrust slightly forward to keep your mouth closed and airway clear. Unlike the CPAP and most MADs (mandibular adjustment device) and TRDs (tongue retaining device), it has not been approved by the Food and Drug Administration. The chinstraps arrived within 2-3 days. I had to order two sizes: a small for my wife and medium for me. The sizes are based on weight. We simply slipped them over our heads and that was that! The semi-masks held our chins slightly forward and our mouths closed. After the first night, we were both surprised to find out mouths a bit sore. We expected soreness with a MAD or TRD but did not think a chinstrap would cause discomfort. However, the soreness went away after the first few nights of wear. My son, who was studying late that first night, reported that he did not hear any snoring. Cleaning was easy. My wife tossed them in the washer and they came out smelling fresh and clean. My Snoring Solution has a 90-day, money back guarantee. After a few weeks wear, despite how silly wearing the mask made us look, the My Snoring Solution lived up to its name. We awoke each morning refreshed and we did not snore. A CPAP machine comes in several parts that require assembly after purchase. There is a mask, tubing, the machine pump and an internal filter that must be changed regularly. The mask fits over your head. Most only cover your nose but some cover your mouth too. To clean it, at least once a week you must detach the hose and mask and wash everything in warm soapy water. The pump can be wiped down with a damp cloth. CPAPS require a doctor’s prescription before purchase. You can either have a sleep study done by a physician or for some companies fill out an online questionnaire and pay for the company contracted doctor to evaluate your answers and write the prescription. Once you provide a copy of the prescription, you can order the machine online. 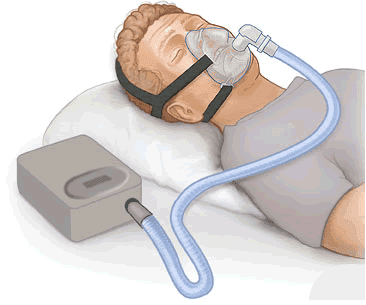 Most CPAP manufacturers offer several accessories for their units. Many users need a humidifier as the pressurized air often dries out their throats. You do not need a doctor’s written approval to buy a mask, filter, tubing and any other replacement components or accessories. The cleaning takes a little longer than other anti-snoring devices on the market. Even though they recommend you do so once a week, most people find that they need to clean it at least every other day. I was surprised at how effective the My Snoring Solution was at stopping my wife and me from snoring. The cleaning too made it a favorite for me and my wife. The CPAP works extremely well and the air pump makes surprisingly little noise. The cleaning makes it a bit cumbersome and time-consuming to use, however. Sleep apnea sufferers likely will choose a CPAP. Most medical insurance plans will pay for all or part of the cost. My Snoring Solution worked perfectly for my wife and me. It was easy to wear and cleaning took no time at all. If you end up going with My Snoring Solution, I suggest using a My Snoring Solution coupon to maximize savings.